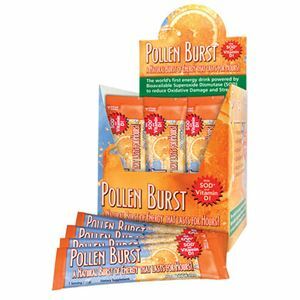 POLLEN PROJOBA BURST is the world’s leading energy drink powered by pollen from the flower. With vitamin D and powerful antioxidant superoxide dismutase (SOD), this delicious drink with natural orange flavor helps fight cell damage from free radicals, toxins and other environmental problems. Directions: Adults, pour the contents of a package in 8 ounces of water, stir well and serve. suggested maximum use is 2 packs per day. Ingredients: glucuronolactone, superoxide dismutase, comples gliadin, green tea extract, caffeine, inositol, pollen extract, fructose, glucose, maltodextrin, citric acid, natural flavors, stevia and silicon dioxide.